For full details about positron and entanglement phenomenon, please refer to the above links. 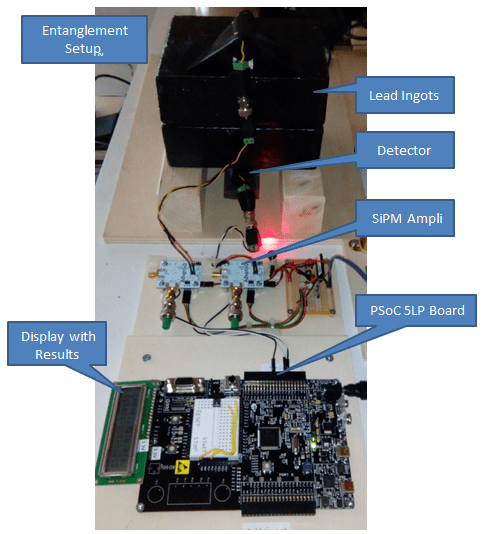 In this post we will focus mainly on the application of the PSoC Coincidence Detector, while we describe only briefly the physical aspect of the phenomena. A positron may be generated by β radioactive decay or by interaction with matter of photons with more than 1,022 MeV energy : this last process is called pair production, as it generates an electron and a positron. In our case we used the Na 22 β isotope that decays by emitting a positron. The isotope 22Na decays (in 99.95 % of cases) with half-life of 2.6 years for positron emission or electron capture to the first excited state of the Ne 22 at 1.274 MeV (which subsequently relaxes to gamma photon emission). The positrons emitted by the source annihilate in the material that acts as a support to the source, producing two gamma photons of 0.511 MeV energy each. The two 0.511 MeV gamma photons are emitted at 180° from each other. This allows to carry out measurements of angular correlation and coincidence. 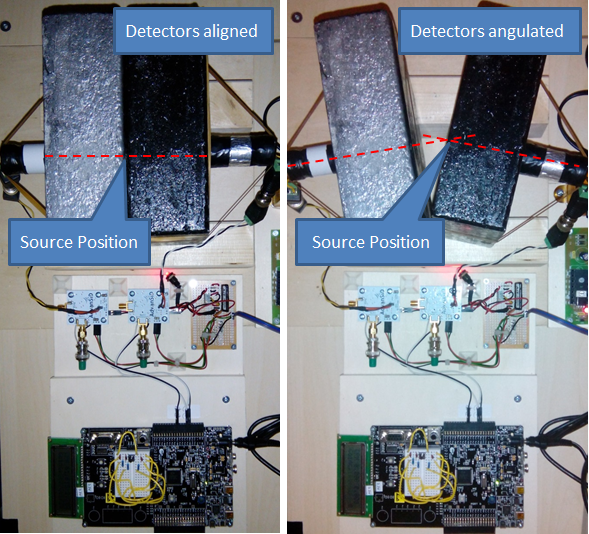 There have been two measurements, the first with the detectors aligned (left image) and the second with the detectors angled between them but both aligned to the source. In the measurement with the detectors angled, the detector 1 is little further from the source than the detector 2, and in fact the value measured by the detector 1 is slightly lower. It is clear that the rate of coincidences count goes to virtually zero as soon as the two detectors are positioned off axis, this is a proof of the fact that the gamma photons emitted from the positron annihilation, because of conservation of momentum, are spatially phase-shifted exactly by 180°. The experiment described in this post is the repetition of the famous experiment of Wu – Shaknov in which it will demonstrate the angular correlation of gamma photons emitted from the annihilation of the positron and subsequently scattered by a compton scatterer. We have already described in the post on the annihilation of the positron that the two gamma photons of 511 keV, for the conservation of momentum, are emitted on the same line but in opposite directions. From theoretical considerations also it is known that they have spin phased out by π/2 . The two photons that result from the annihilation of the positron have all what is need in order to form a single quantum system, from which it follows that the two gamma photons are entangled one to another. The following diagram represents the experiment setup. The Na22 source of gamma photons is placed in between two lead ingots, with a hole in the center to give rise to two collimated beams of gamma rays. The collimated beams hit two iron cylinders that act as compton scatterer. 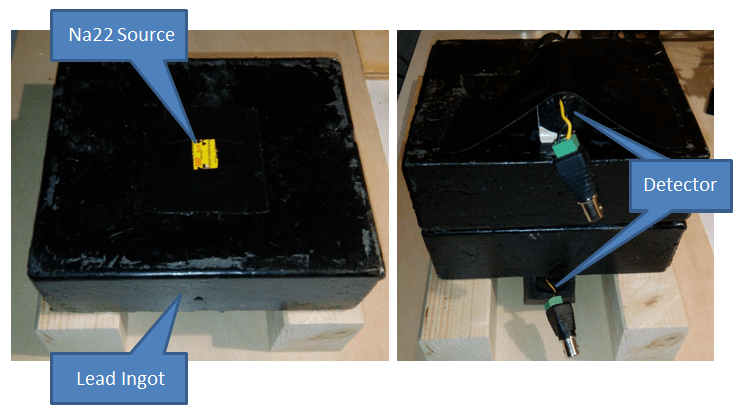 The SiPM detectors with LYSO scintillator crystal are placed laterally so as to capture the radiation scattered at around 90° angle. One detector is maintained in a fixed position, while the other is positioned parallel to the first and subsequently placed orthogonal. The two detectors are operated in coincidence mode to detect only the photon pairs generated by the same annihilation. The two gamma photons produced from annihilation have spin phased out by π/2 and their state of entangled photons should ensure that this angular correlation manifests itself with different counting rates in relation to the relative position of the two detectors. In particular, you should have the greater count rate when the two detectors are positioned orthogonal and minimum when they are parallel, the ratio between the two counting rates should have a value equal to 2. These values are compatible with the theoretical predictions (and the experimental verification made, for example, in the experiment of Wu-Shaknov) establishing a greater counting rate in the case where the detectors are orthogonal. This is considered a confirmation that the emitted gamma photons are polarized at planes shifted by 90° phase. This result is compatible with the hypothesis that the two gamma photons are entangled. It is interesting that in the background rate measurement you get a value greater than the theoretical one, calculated on the based of the time resolution of the detector which is 0,037 CPM. This can be explained by the fact that the detectors were placed on two horizontal planes one above the other : so it is not negligible the contribution of cosmic rays. In fact, the measure with detectors parallel (that is vertically aligned) is greater than with detector orthogonal. We thank AdvanSiD, especially Claudio and Alessandro , for providing the SiPM modules used in the experiments. We thank Professor Clifford John Bland for suggestions, support, and computer simulations. 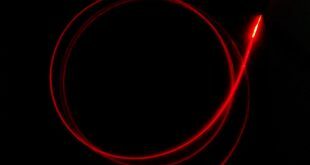 Article in “Scientific American” with description of a similar experiment : How to build your own quantum entanglement experiment.